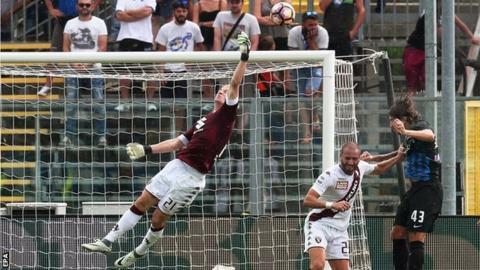 England keeper Joe Hart made a mistake to concede an equalising goal and was then beaten by a penalty as his Torino debut ended in defeat at Atalanta. Hart, on loan to the Italian club from Manchester City, failed to deal with a corner as he palmed the ball to Andrea Masiello to slot home for the hosts. The 29-year-old was then beaten by Franck Kessie's late spot-kick as Atalanta fought back to win 2-1. It was their first Serie A victory of the season and Torino's second loss. It was not the beginning to his Serie A career Hart would have wanted after being allowed to leave Etihad Stadium by new City manager Pep Guardiola. His afternoon started badly when Torino got his name wrong on the team sheet. Things picked up when his team went in front through a well-struck Iago Falque free-kick eight minutes into the second half. Up to that point, it had been a virtual watching brief for Hart, bar one smart low block in the first half. But things went downhill just two minutes later when he tried to intercept a corner but failed to reach the ball properly and was left stranded as Masiello made it 1-1. Hart had a chance to make amends when Atalanta were awarded a late penalty, but Kessie sent him the wrong way from the spot to earn the hosts their first points of the season. Hart's City career was ended - for now at least - by Guardiola replacing him for the opening three Premier League games with Willy Caballero before signing of Claudio Bravo from Barcelona. Chile international Bravo made his City debut in Saturday's 2-1 derby win over Manchester United at Old Trafford - but the 33-year-old produced a far from convincing performance. However, Hart was unable to give critics of Guardiola's decision to let him leave further ammunition at the start of his season-long stay in Italy. He, and Torino, will hope things get better, starting with a home fixture against Empoli next Sunday (14:00 BST kick-off). Match ends, Atalanta 2, Torino 1. Second Half ends, Atalanta 2, Torino 1. Afriyie Acquah (Torino) is shown the yellow card for a bad foul. Franck Kessié (Atalanta) wins a free kick in the attacking half. Attempt blocked. Alberto Paloschi (Atalanta) right footed shot from the centre of the box is blocked. Assisted by Alejandro Gomez. Foul by Joel Obi (Torino). Alejandro Gomez (Atalanta) wins a free kick on the right wing. Attempt missed. Rafael Toloi (Atalanta) right footed shot from more than 35 yards is too high following a set piece situation. Foul by Leandro Castán (Torino). Alberto Paloschi (Atalanta) wins a free kick on the right wing. Leandro Castán (Torino) wins a free kick in the defensive half. Foul by Alberto Paloschi (Atalanta). Attempt missed. Iago Falque (Torino) left footed shot from outside the box is too high from a direct free kick. Iago Falque (Torino) wins a free kick in the attacking half. Foul by Franck Kessié (Atalanta). Alberto Grassi (Atalanta) wins a free kick in the defensive half. Attempt blocked. Joel Obi (Torino) left footed shot from outside the box is blocked. Goal! Atalanta 2, Torino 1. Franck Kessié (Atalanta) converts the penalty with a right footed shot to the bottom right corner. Penalty conceded by Lorenzo De Silvestri (Torino) after a foul in the penalty area. Penalty Atalanta. Alejandro Gomez draws a foul in the penalty area. Attempt blocked. Alejandro Gomez (Atalanta) left footed shot from the left side of the box is blocked. Assisted by Marco Sportiello. Attempt saved. Lorenzo De Silvestri (Torino) header from the centre of the box is saved in the bottom left corner. Assisted by Iago Falque with a cross. Corner, Torino. Conceded by Rafael Toloi. Lucas Boyé (Torino) wins a free kick in the defensive half. Substitution, Torino. Afriyie Acquah replaces Marco Benassi. Foul by Lucas Boyé (Torino). Marco Benassi (Torino) wins a free kick in the defensive half. Attempt saved. Iago Falque (Torino) left footed shot from the right side of the box is saved in the centre of the goal. Assisted by Joel Obi. Attempt saved. Lucas Boyé (Torino) left footed shot from the centre of the box is saved in the centre of the goal. Assisted by Marco Benassi. Attempt missed. Alberto Grassi (Atalanta) right footed shot from the centre of the box is too high. Assisted by Cristian Raimondi with a cross. Attempt missed. Marco D'Alessandro (Atalanta) right footed shot from the centre of the box is close, but misses the top right corner. Assisted by Alejandro Gomez following a fast break. Foul by Maxi López (Torino).